A week ago we had two pairs of visitors, one on their final day in Thailand after a month-long vacation and another on their first day in Thailand on the start of a multi-week vacation. 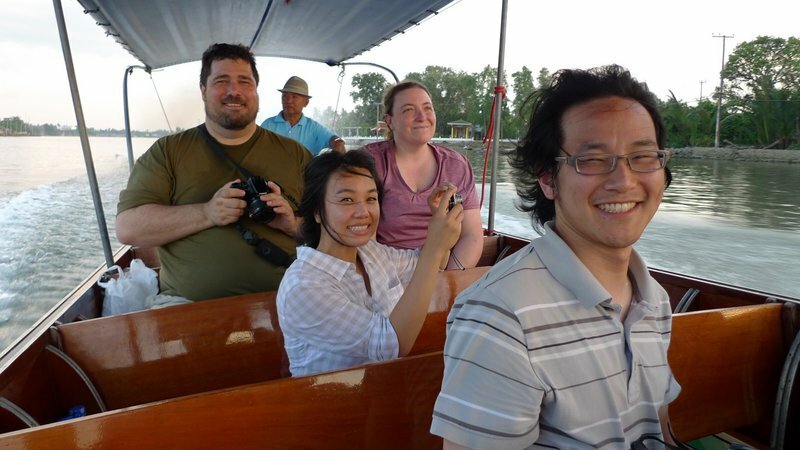 While the two pairs had never met, I rented a van and driver, bundled them all in, and took them down on a Friday night to the floating market in Amphawa, a town about 90 minutes southwest of Bangkok. I’ve been to Amphawa many times but on each visit I discover something new or, at least, a new way to approach it. As such, I feel like I’m refining this “tour”, if you will. Each subsequent guest gets a better experience. For example, I have decided that Fridays are a much better day to go than Saturday or Sunday because the market is much less crowded. I’ve also decided that it is best to hire a boat and visit several of the temples along the river in the hour or so before sunset. This way you get few tourists but lots of interesting “golden” light. This temple, which has been abandoned to the forest, is at Bang Gung (literally, “Area of the Shrimp”) and while I’ve visited here on bicycle before, I didn’t realize it was an easy walk from the river. Add that to future itineraries. Riding a long-tail boat down the Mae Khlong River just after sunset it a breathtaking experience. The sky is so beautiful and the water is so calm. Afterwards we explored the floating market, ate lots of tasty, fresh, and inexpensive seafood and other treats before heading back to Bangkok. October 2010 – A trip to the market finds is nearly flooded. June 2010 – A grade school friend and his children visit on a “top secret” assignment. January 2010 – a trip to the market with a Xangan from London. December 2007 – An early trip there with an American friend and his mother. This entry was posted in Uncategorized and tagged Amphawa, Floating, Market, Province, Samut, Samut Songkhram, Songkhram, Thailand, travel, Weekend by christao408. Bookmark the permalink. Beautiful and yes – breath taking. 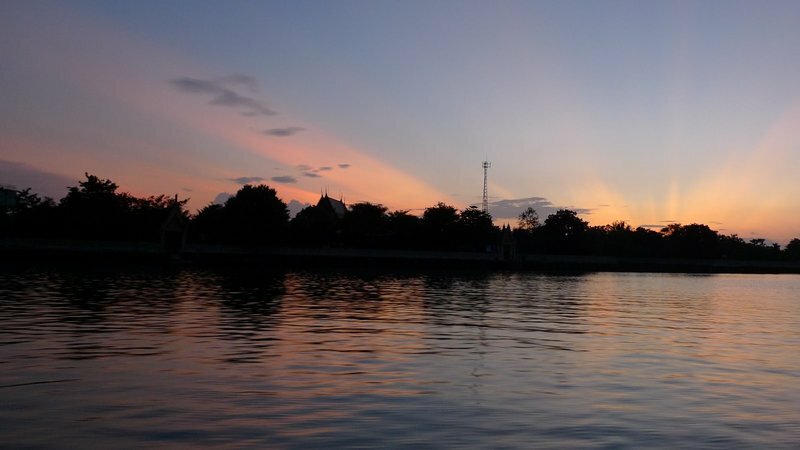 Nice sunset scene, miss the floating market! A boat trip is a must-do for all visitors to the Big Mango! 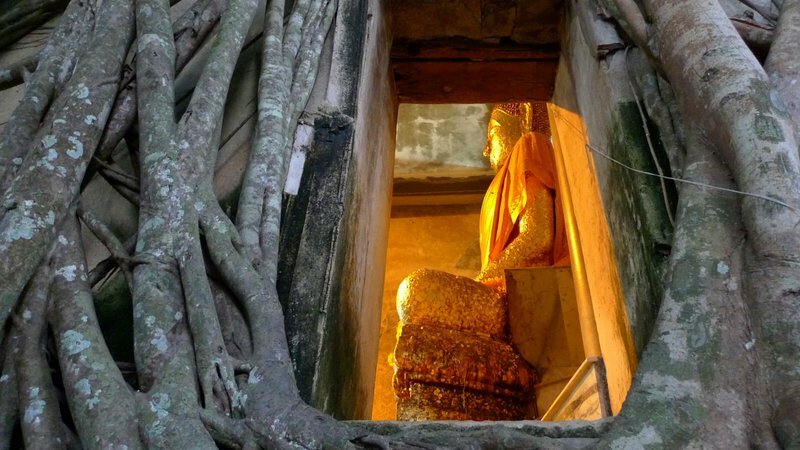 I love the picture of the Buddha framed by the tree roots. I’m glad your tours are getting refined. By the time I make it to BKK, it should be ready for prime time. hee hee…Have you considered doing this as a sideline? The temple picture really fascinates me! Good job. The Buddha among the trees attracted me immediately. Somehow I found it very relaxing and quiet. So when will you add a gourmet meal to the tour. Loved the pictures of the temple set within the roots. Banyan tree? 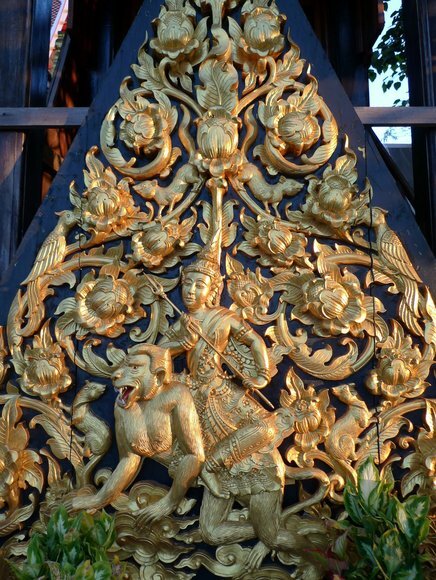 The Buddha pic is very Angkor Wat-ish… isn’t it? Looks like an interesting place. Your friends are so lucky to have you as their tour guide.